After A Prince Among Thieves failed to hit as hard as it should have, Paul took some time to do his Handsome Boy Modeling School thing and eventually came back with this, a semi-vitriolic assessment of how fucked-up the record industry is. I'm not going to act like I was down with this since day one. I didn't buy this until a few years ago, and hadn't really heard much about it before that. But when I found it in the five-dollar bin at one of my local record stores, I figured I'd give it a shot. And, while this record is definitely a little pissy in places (Dave Chappelle's record exec portrayal is not meant to be flattering, but it is his hilarious) - almost reaching the point of sour grapes - the beats are awesome, and the guest spots are well-chosen. 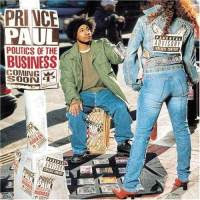 Again, Paul gathers some of the dudes in hip hop who "get it" (Chubb Rock, Guru, Chuck D, Ice-T, and a bunch more), and gets the most out of them. I don't know who Horror City is (though I plan to download this after I'm done writing this), but the dudes are rough-edged and a little bit dope. Prince Paul's beats also make anyone sound better than they usually are: I've always thought Tash was a pretty sweet rapper, but the guy kills it on "Original Chryme Pays." Coming back with another concept/message album after his previous one was a bold move, and since this wasn't a huge hit, I guess you could argue that it didn't really work. But I enjoy this album just as much as A Prince Among Thieves, and might even say that it flows a little better because there's not as much narration. And I can't believe I only own two Prince Paul albums. I guess there's only five real solo albums from him, but I should have them. Something to work on.